Which social media post is your favorite? Which sip is your favorite: the first or the last? Its simple and direct. No airs and graces. It contains a neat little NLP auto-suggestion. It sets in motion a thought pattern in which it is assumed that you already like Nespresso. It gets you thinking about another question before you've had a chance to question: "Hang on, who says I even like Nespresso at all?" Clearly, someone who consciously strongly dislikes Nespresso may be able to override this suggestion, but then they are almost certainly not the target of this little promotion. There is clearly no right or wrong answer, and no sense that anyone is any more or less qualified to answer it than anyone else is. As a result, everyone feels equally entitle to express a view and become engaged. 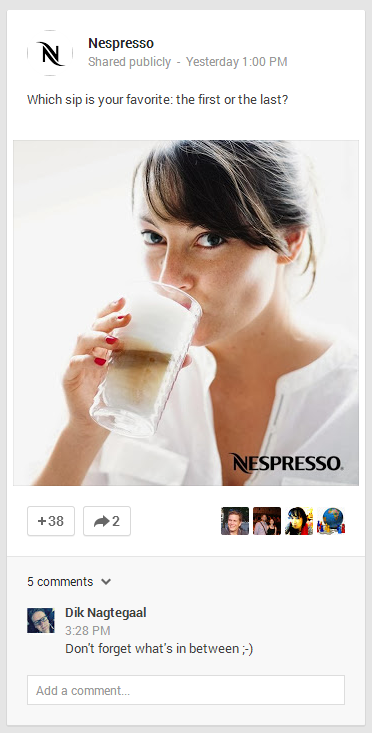 But whatever view you express, even if your view is to challenge the question itself (see the comment below the post itself), you're still most likely doing so within the overall context of liking Nespresso. Anyone who reads the question will immediately and subconsciously start to think about enjoying Nespresso, whether they've ever done so before or not - that's the only way to engage with the question! Perfect marketing.